The aim of compaction is to remove entrapped air. The entrapped air reduces the strength of concrete considerably. A study shows that concrete strength is reduce to 30% with 5% voids in the mix due to improper compaction. A reduction of more than 50% is found due to presence of 10% voids. 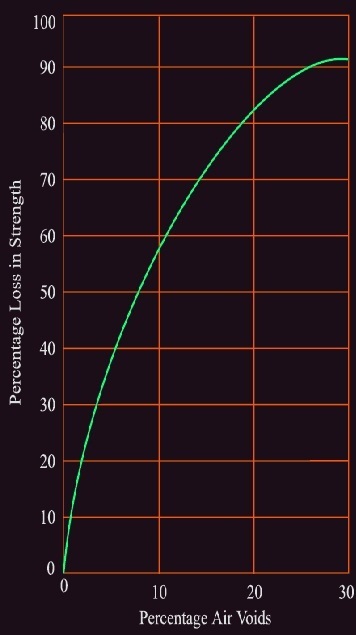 A figure is provided to explain air-void to reduction in strength relationship in percentage. For higher strength concrete mix designer is now using low water-cement ratio and problem arises there. Low water-cement ratio produces a less workable concrete if some type of water reducing admixtures or additives are not used. A less workable concrete trapped more air than a higher workable concrete mix i.e. stiff mix of concrete have more entrapped air requiring high efforts to remove this entrapped air from mix by compaction. From the above figure we can understand the importance of 100% compaction and 0% air void achievement in concrete. As durability is concerned, 100% compaction is also required for durability of concrete as well as strength of concrete. Now-a-days designers give more priority to durability of concrete than strength. The presence of void increases permeability of concrete and permeability opens the way to entry aggressive chemicals. Thus deterioration of concrete and reinforcement as well takes place. Therefore an optimum water-cement ratio have to set to have a fully compacted dense concrete with the help of available, affordable, accessible and reasonable compaction that take long compaction and not supposed to have segregation of constituent material and to chose economical compaction options. It should keep in mind that only a maximum possible driest mix with 100% compaction having 0% air void produce a concrete of maximum strength and durability.